This guide is for the 1996 arcade game. For the 2005 PlayStation Portable game, see Dig Dug Arrangement (2005). 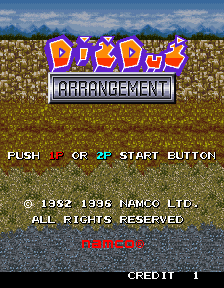 Dig Dug Arrangement is, as the name suggests, a remake of Namco's 1982 arcade game Dig Dug; it was released in 1996, as a part of the compilation arcade game, Namco Classics Collection Vol. 2, and later rereleased alongside the original and ten others in the Nintendo GameCube, PlayStation 2 and Xbox versions of Namco Museum in 2002. Two players can also play this game simultaneously (the second player takes control of yellow-and-white-suited version of Dig Dug) - and as in Toy Pop, Cosmo Gang: The Video, Bakuretsu Quiz Ma-Q Dai-Bouken and Lucky & Wild, both players' scores are combined (one can also pump the other up until he explodes to kill him for 10000 points, or drop a rock on him). Several new songs were also composed (and unlike in the original, they are not only heard when the Dig Dugs are moving), and a Tank Force-like overworld map showing the Dig Dugs' current position gets displayed before every round; several new enemies have also been introduced (including enormous mechanical versions of the original Pookas and Fygars, who serve as bosses). The Dodongadon and Jammers (from the Cosmo Gang series) also return as enemies, and several new bonus items (including a new type of special bonus item, one of which is the Special Flag, from Rally-X) have also been introduced; there is even a new kind of enormous rock that goes straight to the bottom of the screen, along with the Balls and Containers (again, from the Cosmo Gang series). Even though this was to be the last arcade title in the Dig Dug series, there is a round based on the original Dig Dug in 1998's Tenkomori Shooting (along with three others based on Galaxian, Galaga and Xevious, which visualize what those three games might have looked like if they'd featured two-player simultaneous play) where a certain amount of Pookas must be killed before a timer runs out. This page was last edited on 19 December 2018, at 16:32.